Looking at KMRY, it never did clear off today (per forecast). The best was OVC016, so an instrument approach does seem likely tomorrow. Nearby KSNS cleared off to SCT018 at 2015Z, but that wouldn’t have really helped. That means a possible IFR departure back out of MRY too. KEMT went to marginal VFR around 1000 local, but a special VFR departure [not recommended in most cases for new VFR pilots] would have been possible. The TAFs for BUR and ONT indicated a similar pattern tomorrow, so it will be a morning evaluation as to whether VFR, special VFR or IFR is the right answer on departure. 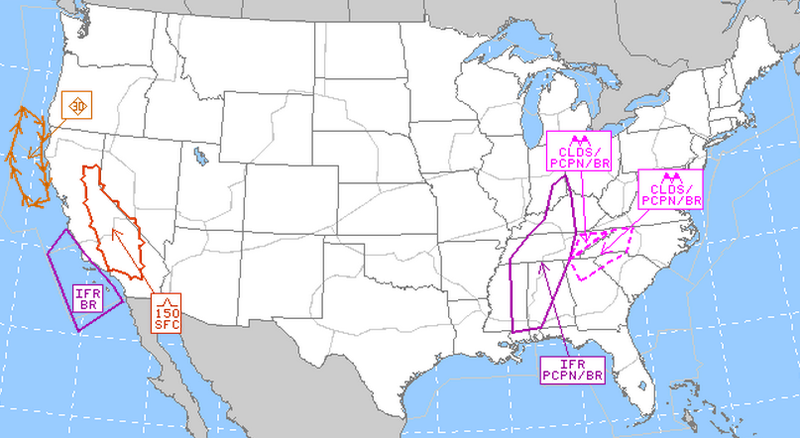 The only AIRMET that looks to affect us so far (though they don’t yet extend far enough out) would be for IFR conditions along the coast (as already discussed above). In conditions like this, it’s not uncommon for KEMT visibility to improve but for a cloud layer to form right around 800 local, before burning off later. The AIRMET forecasts only go out until late this evening, but show the surface winds staying north of MRY, but an AIRMET for turbulence covering the inland areas near our route of flight (very common to have this). For winds aloft, the graphics for the time of our departure haven’t changed much, but the text versions start to give us some numbers that we could try out for groundspeed and wind correction, showing winds to be out of the west to southwest, increasing in strength as we go north. TFRs haven’t changed (Disneyland only). The NOTAM at KEMT is gone and the KMRY one’s haven’t changed. See the initial planning (T-5), yesterday’s analysis (T-2) and the trip report to see how it turned out. Did you end up going? Looking fwd to the report if so. This is a flight I’ll want to do regularly when I get my PPL. Great blog, BTW.